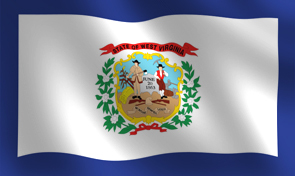 Adopted on March 7, 1929, the flag of West Virginia consists of the state's coat of arms on a white field with a dark blue border. The use of white as a background color represents purity, and the blue border represents the United States. The state seal in the center stands for agriculture and industry, and also bears the state motto, "Montani Semper Liberi," meaning "Mountaineers are always free." The rock between the miner and farmer bears the date June 20, 1893 which is the day West Virginia became the 35th state to join the Union.